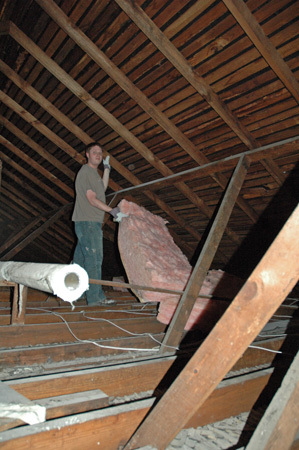 I think insulation, or the lack thereof, is always a big issue with these old homes. Our home, like so many others, has none. When we redid the kitchen, bathroom, and laundry room we were able to put insulation into the walls at that point. All other rooms as well as the attic and crawl space remained open territory – the perfect openings for all of our heat to wander off through. It doesn’t help that I like warm temperatures. In the summer I’ll always carry a jacket with me because I know any place I go – the grocery store, a restaurant, someone’s house – I’ll end up freezing. That also means I like to crank up the heat in the winter time to feel nice and snuggly warm. As the temperatures started dropping in the fall we generously turned on the heater. As it got colder the bills got higher and we adjusted the thermostat to more conservative measures. Then we got another higher bill. We adjusted even more conservatively. And the bill came in higher again. I know as the months went on and the temperatures kept dropping that the bills would go up, but it was weird nonetheless that the more we tried to be thermostat conscious, the higher the bill ended up getting. 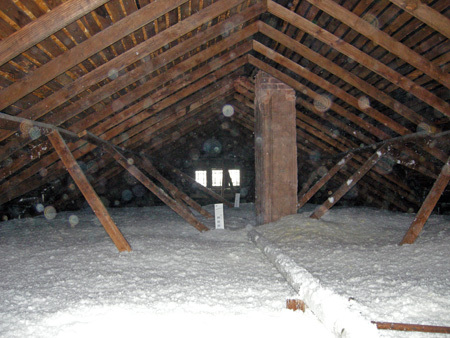 And here’s the attic after today. A winter wonderland! Not sure how much the bills will change this year, but next winter I better be seeing some savings on those gas bills!! 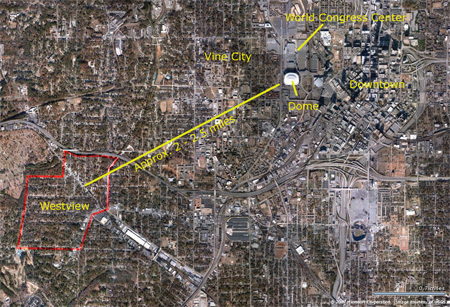 I’m sure most people heard about the tornado sweeping through downtown Atlanta, and since someone expressed concern I thought I would write about it and show that we should be pretty thankful that we made it through unharmed. It’s actually kind of crazy because we didn’t have a branch down or a flower pot turned over or anything! I guess that’s the one good thing about tornados – they stay pretty isolated to the area they hit. So even though we were pretty close we didn’t notice anything. Patrick and I were just spending a quiet Friday night at home. We have been very involved in preparing for Westview’s booth at the Atlanta Home Show at the World Congress Center and had just worked the Thursday shift, so we thought we’d keep it calm on Friday after a busy setup and prep week. Other neighbors had worked the Friday shift and we were due back to work a Saturday shift, so it was just another reason to keep it calm. It started thundering and lightning so we got off the computer and decided to watch a movie instead. Around 9:30pm it got a bit crazy, but I wouldn’t have thought it was more serious than a typical heavy summer thunderstorm (not that it’s summer, but I’m just saying we’re used to them a lot from the summer). There was one thing that threw us off a little bit, and that was how the downpour and wind came in waves. It would come down like crazy and the wind would blow really hard and rattle the windows, then it would be dead quiet. Then it would start the process over again. It wasn’t until our neighbor, who had just come back from her Home Show shift at the World Trade Center an hour and a half earlier, called to say she was just told a hole had been torn in the Dome and wanted to know if everything was okay in our neighborhood. We turned on the TV and realized all the craziness going on right down the street from us. As we went to bed after hours of watching the news we knew we were probably not going to work our Saturday shift at the Home Show – after all, photos and video footage were showing water pouring down the escalator of the building we had our booth set up in! Sure enough, the rest of the exhibit ended up being canceled. So what do curious photographers do on the morning after a disaster? They do what they’re told not to do, and that’s to photograph the damage. See where Westview is? We’re about 2 – 2.5 miles away from the Downtown area where everything was damaged! You can also see the Vine City neighborhood to the north of us. Unlike Cabbagetown (to the right of the city), Vine City didn’t get as much exposure, but still experienced some serious damage as well. Again, considering how close we are to the disaster area I can say with relief that not a flower pot was knocked over! My heart just cried seeing all those historic homes being damaged beyond repair; those beautiful large old trees being knocked down. Knowing how much work we’ve put into our house, worrying about every little detail and getting that last bit of paint out with a toothpick…imagine all that destroyed in a matter of seconds. It really is sad. We’ve been working on small projects here and there. Some more pleasant than others. 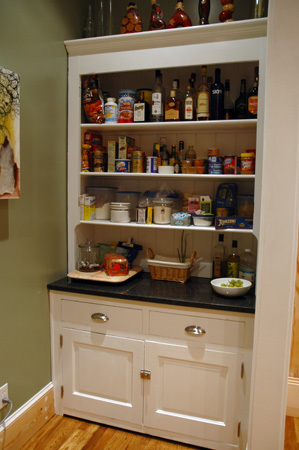 One exciting one was installing the second butler’s pantry door on the bottom. It’s been kind of funny having one attached door and the other one missing. The first one was such a pain that I think we’ve been procrastinating on the second one. To our surprise the second one was soooo much easier! I guess Patrick has become a better chiseler. Additionally he tried out a sanding drill bit to cut out the area more evenly. We still have some adjusting to do, but here are the attached bottom doors. Voila! In the meanwhile I was running back and forth between the kitchen helping Patrick and working on removing paint in the bathroom. Nothing too exciting to report from the bathroom yet. We’ve just been removing a bit more paint from the built-in and from the door and molding. Then we’ve done a few more things like hanging up artwork. I know, it’s been like what – a year, year and a half since we’ve moved in? And we’re only now hanging up art? I suppose this is the part where I don’t mention that we have about 10 more pieces stacked in our hallway collecting dust. I don’t know how we do it…every time that hallway is free of crap more stuff seems to appear in its place. Oh, and in other unwelcoming news – our gas bill! I think some people pay as much for rent as we have for our gas bills. So we started getting attic insulation quotes. One of those boring projects that costs money and doesn’t do anything for us aesthetically!